At the moment, I can’t think of anything better than cracking the windows wide, turning the volume way up and dropping the stylus on the opening grooves of “Criola,” the opening track on Jorge Ben’s self-titled 1969 LP. It’s a breezy, kaleidoscopic, wondrous and bizarrely produced record that lands within the heyday of Brazilian Tropicalia. Just like his contemporaries Os Mutantes, Caetano Veloso, Gilberto Gil and Gal Costa, Ben beautifully merged the worlds of bossanova, samba, pop, psychedelic rock, the avant garde alongside political motivations during the artistic explosion in Brazil that came to be known as Tropicalia. 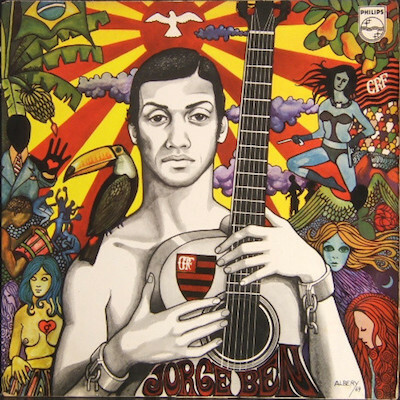 Jorge Ben is most definitely one of his greatest achievements in what would become a long career. It contains some of his best know songs (“Pais Tropical”, “Charles Anjo 45”), and features the backing band Trio Mocotó who would become successful in their own right thanks to their time with Ben. There’s much to get lost in on the LP. It’s pulsating with surging strings, bright horns, hypnotic rhythms and tasteful, yet mind-bening, psychedelic effects with Ben confidently leading the way.